Local anaesthesia is used when there is a procedure to be performed and the patient doesn’t need to be unconscious. Local anaesthesia will stop the pain response in a specific, localized area which causes loss of sensation to that area. It is commonly used for short procedures such as a biopsy which is the removal of a small portion of tissue in order for it to be examined. There are a couple different types of local anaesthesia but the most common ones used in veterinary medicine are epidurals, nerve blocks for dentistries, subcutaneous or superficial skin blocks, and splash blocks on open wounds or incisions. Local anaesthesia can be used in conjunction with sedation or general anaesthesia in order to provide longer pain control after the procedure is finished. This is called a multi-modal pain control approach where different modes of pain control are used at one time for optimal pain management. 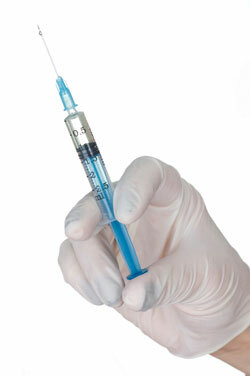 Dental nerve blocks are an example of this and are often used when a diseased tooth or teeth need to be removed. The affected part of the mouth is frozen, much the same as humans when they have a cavity filled, which provides longer pain control to that area even after the anaesthesia is over. This allows us to keep our patients comfortable longer then if just using general anaesthesia. Local anaesthetic is commonly administered by injection to the affected area but can also be applied directly on the skin around the area as well. An example of this is during a dog spay. A splash block can be given where the local anaesthesia is “splashed” or dripped into the incision as that area can be very sensitive to the patient. This gets absorbed into the blood vessels and provides pain control to that area. Local Anaesthesia can also be paired with sedation in order to provide pain relief and relaxation during procedures for our patients. It is our goal to provide a stress-free and pain-free experience for your pet whenever possible. Please contact us if you have any questions or concerns about your pet receiving local anaesthesia.